Slither.io is a relatively simple game that has gone viral due to its simple yet incredibly addictive and competitive gameplay which everybody can enjoy. Chomp down on glowing food pellets to grow your snake, avoid colliding with other snakes, and try your best to trap other snakes. Climb the leaderboard by being the biggest and baddest snake around and stop other snakes from taking your crown! How long can you survive in the snakes-filled arena in Slither.io? Play now and find out! To start playing, all you need to do is to load up the website, input your username (you don’t even need to sign up or anything like that), and click “Play”. Based on the classic Snake game, the premise of Slither.io is incredibly simple. All you need to do in this game is to gobble up as many glowing food pellets as you can to grow your snake. Most of the foodstuff can be found in the center of the map where the larger snakes tend to dwell in. The food distribution radiates outwards gradually, so the “outskirts” will usually have less snake food. How do you play this game then? 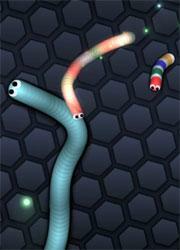 You can move your snake simply by moving your mouse or finger, depending on the platform you are playing this game on. There is no restriction as to how you can move your snake, but of course, the game’s slithering mechanism mimics the natural movement of real life snakes, so you definitely cannot make an exact 90-degree turn with your snake in this game. It’s realistic in that sense. Sounds simple enough? Well, it is.... somewhat. There’s a catch in this game though – you mustn’t collide with any other snakes within the game confines. It’s all in the position of your snake’s head, you see. If it hits any part of another snake, regardless of that size of the other snake, your snake will disintegrate into larger globules of food matter which other snakes can feast on to grow more rapidly. There are many maneuvers that you can use to avoid a collision and most of them involve using the speed boost. Unlike the traditional Snake game, you can hold your mouse button to trigger a burst of speed for a short period of time. It’s a snake life-saving tool that you can use to rapidly switch direction to narrowly avoid an impending collision. That being said, most of the time, you’ll not only be trying to avoid accidentally colliding with other players, you may sometimes be actually targeted by an opponent. They might move rapidly towards you using the speed boost to cut you off and hence killing your snake. The other snake may also decide to perform a choke-hold maneuver and cut off any chance of you escaping by sneakily coiling its body around your snake. Strategy and technique are quite important in this game and this may come as a surprise to some players as the game looks seemingly like an easy game to play. 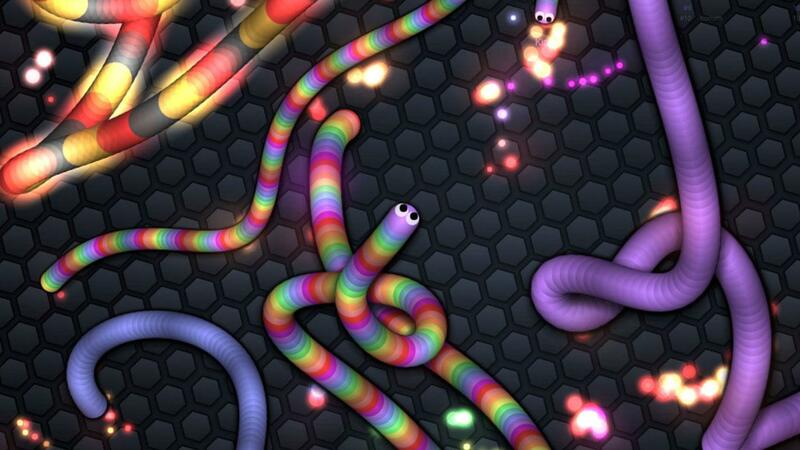 By growing your snake, you’ll gradually climb up the leaderboard situated at the top right corner of the screen. It’s no easy matter if you intend to see your name among those “elites” though. Did a rainbow-colored snake just pass you by? What’s going on? Well, as you play Slither.io, you’ll notice that there are plenty of fancier snakes slithering around in this game... now, you’ll probably be wondering – “where can I get one of those?” It’s very easy, really. By simply sharing the game on either Twitter or Facebook, you will unlock access to over 43 custom skins which you can then use for your snake in the game. There are not only many different colors that you can choose from, there are even really unique skins like the one with the UK flag pinned to its head or the snake that has a color scheme of the US flag. If you would like to take one step further, you can even get the many mods available for free on the internet. Some even allow you to personalize your snakes by designing your own skins! Slither.io is, without a doubt, exciting and very addictive, but unfortunately, even a simple game like this have downsides. One of the most pressing problem with the game is the random lags. You might be on the edge of your seat trying to outwit a larger snake that is hot on your tail only to find yourself “killed” after a latency spike. It can be pretty frustrating, but well, that’s mainly because the insane number of players in the same environment as you are. This is pretty much something that has been plaguing most MMOs for ages. 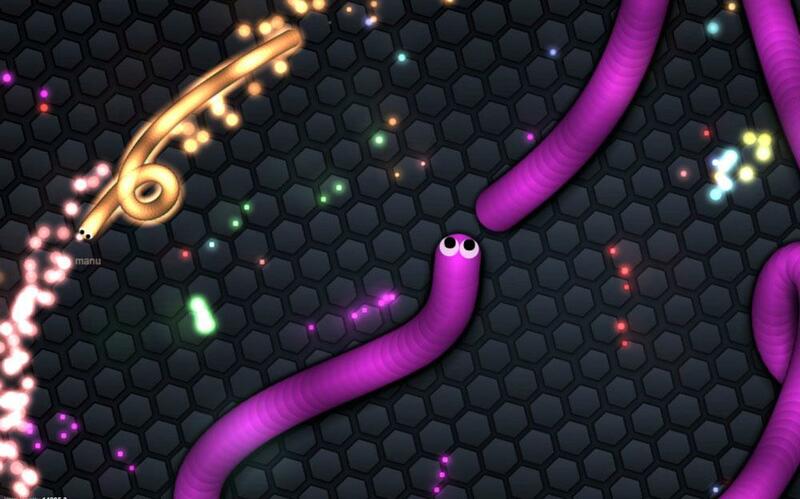 Perhaps due to its shot to fame and popularity, Slither.io has an amazingly robust community of players. You’ll never find a game of Slither.io empty or having less than 20 or 30 people around. Since the more players, the more fun it is – this is actually a really good thing for the game. Let’s not forget that by sharing the game on your social media sites, you might be able to play with your friends (not as a team though) in Slither.io. The game offers 2 graphics options – low or high, depending on your browser and PC performance. Considering that the game itself doesn’t really consume a lot of memory, most players would probably be playing the game in high resolution. Slither.io provides no sound. To sum this all up, Slither.io is hands-down one of the most entertaining yet competitive casual games around. Derived from the classic Snake game, you’ll get to enjoy munching down the many glowing foodstuff with all the other snakes around. However, do keep vigilant and stay well away from any malicious snakes – they might just turn on you and disintegrate your snake into food matter. There are also up to a whopping 43 different types of snake skins to choose from if you want to appear fancier than the general lot. The game has won touted as one of the most viral games since Agar.io and Flappy Bird, and this is for good reasons. So, if you’re up for hours and hours of casual fun, Slither.io is definitely the game for you. Be sure to give it a try and find out what all the fuss surrounding this game is about! by Aethyna Jun 30, 2016 Chomp down on glowing food pellets to grow your snake, avoid colliding with other snakes, and try your best to trap other snakes. Climb the leaderboard by being the biggest and baddest snake around! How long can you survive in the snakes-filled arena in Slither.io? Play now and find out! Read More Be the First to Post a Review!